This Grilled Asparagus Pasta Dish is the perfect light side dish to serve along side your barbecue dishes all summer long. It's Barbecue week, and I'll be joining with bloggers to share recipes to kick start your barbecue season, so get your grills ready folks, we've got some great recipes ahead! Some pasta dishes are just too heavy laden with sauce or oils, and this dish not only features vibrant, and flavorful asparagus, it has a moist and light Parmesan sauce that is just enough to keep your guests coming back for more. Asparagus is the star in this recipe. I grill it all summer long, with the meat on the grill, while the pasta is cooking,but you can also cook this in skillet in doors as well. I promise not to tell anyone you didn't grill it! Michigan Asparagus provided me with this delicious fresh bunch for this recipe today, and it is ready to get grilling! Jan's Tip: for trimming the tough ends of asparagus: bend a spear and where it snaps, trim the remaining bunch at that same length. My veggie grilling tip: At the bottom of this post, after all the other great bbq recipes,is a giveaway from Michigan Asparagus for a chance at grilling package that includes one of my favorite things: a grilling pan! You'll see mine here in this recipe today, we use ours multiple times a week, I need one of theses larger pans they are giving away, I am so jealous! Here's mine with my asparagus and peppers on the grill for today"s recipe! Now.. on to this delicious recipe! Don't let this simple looking dish fool you! It truly is flavorful, moist and perfect for a light and healthy side dish all barbecue season long! This feeds a crowd! Snap or cut off tough ends of asparagus. Cut asparagus into 2 inch pieces. seed and chop red pepper into bite sized pieces. Toast Pecan halves in oven at 325° for 10 min. then remove and let cool while pecans are toasting, begin to boil water for pasta and cook pasta according to package directions. Drain pasta and remove from pan, and set aside .Place vegetables on a grill pan. Drizzle with olive oil and grill over medium heat on grill for about 6 minutes, stirring occasionally. Remove from heat, and bring inside to finish dish.In pan you cooked the pasta in, heat the chicken broth over medium high heat till boiling. Reduce heat to a simmer, and add grilled vegetables, and cook additional 2-3 minutes.Stir in salt, pepper, pasta, basil and 1/2 cup of the Parmesan cheese (reserve 1/4 cup for topping) butter, and 3/4 cup of the pecans (reserve 1/4 cup for topping) Stir together to blend and remove from heat.Pour into a large serving bowl and sprinkle with remaining cheese and pecans. Let’s fire up the grill, serve up some burgers or steaks or chicken and some delicious sides and desserts! Follow #BBQWeek so you don’t miss one delicious recipe.There are more than 20 recipes this week from some amazing bloggers. Giveaway is open to residents of the United States who are 18 years of age or older. Prize will be sent after the close of the giveaway. Bloggers are not responsible for prize fulfillment. Thank you to Michigan Asparagus for sponsoring #BBQWeek and offering the amazing prize package. Michigan Asparagus is giving one winner two grilling baskets and a $50 gift card. Fresh asparagus is the taste of spring and Michigan is one of the largest domestic asparagus growers in the United States. Michigan Asparagus is available mid-May through June and is the only hand snapped harvested asparagus which means more usable asparagus and less waste. Local Michigan farmers produce approximately 25 million pounds of Michigan Asparagus during the state's 6-7 week harvest. Michigan Asparagus has excellent flavor and a long shelf life. It is a nutrient-dense, low-calorie vegetable with no fat, no cholesterol, and very little sodium. This looks soooooooo good! I usually default to roasting asparagus but now I can't wait to play more! 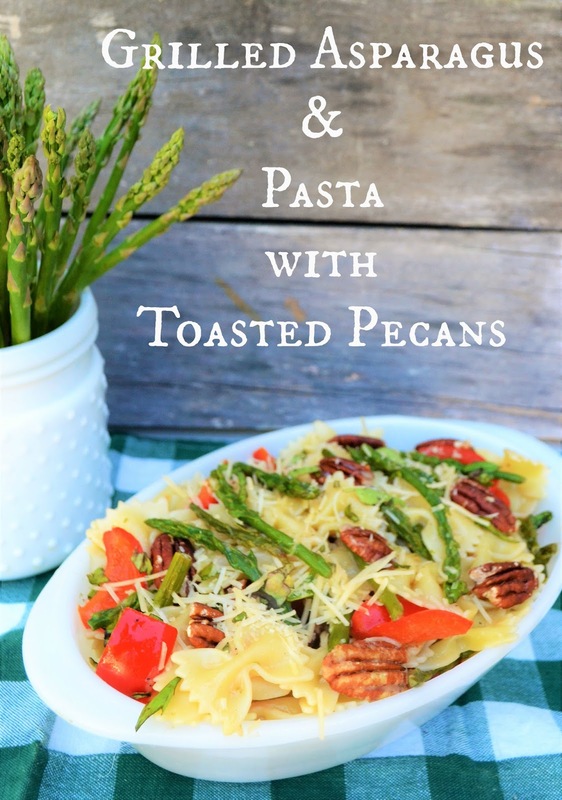 This is such a lovely-looking dish - I love the idea of the pecans in there too. What a perfect meal for when the temps start going up! Colorful and filling but not heavy. Oh, my goodness! That looks delicious. Thanks fro sharing this with #BBQWeek! I love to roast asparagus with garlic :) Great giveaway! I love a light brothy pasta and this looks great with the asparagus and peppers. We usually dice it up and add it to dishes, like omelets or casseroles. You're pasta looks so delicious! Love this recipe! My family really enjoys asparagus and I am always on the lookout for recipes to use it in. I love the addition of pecans to this dish. Mmmmmm the colors! The textures. This looks so good.